I was inspired to make a low fat healthy fish dish while watching an old episode of Martha. The tomato sauce original recipe had over 1/2 cup of olive oil in the salted cod & tomato sauce with the addition of another 1/4 cup of oil served over the finished dish. It looked fantastic, but it was so high in fat, even good for you omega 3 cholesterol lowering olive oil fat, that it had to be drastically reduced in calories. The recipe, while fairly easy, relied on too many cooking steps and methods to be realistic for a quick week night dinner by the home cook - even if the home cook is a pro! If the fat was being taken out of the dish, more flavor needed to be added in practical healthy ways. The answer was to add more vegetables while allowing the tomatoes to stand out. As I watched the tv segment, it dawned on me that the dish, hailing from Southern Italy (the Puligia Region) was similar to bouillabaisse or other tomato sauce and seafood dishes. 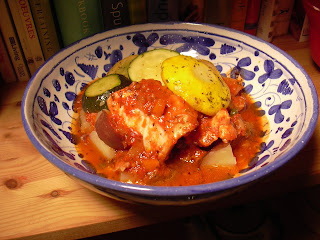 The fish could be poached in the tomato sauce, adding depth of flavor and reducing the need to turn on the oven. What follows is a step by step photo recipe for my version of: Poached Medi Cod in Tomato Sauce Pick the best plum tomatoes you can find. About 2 pounds worth. 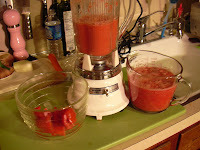 Wash the tomatoes and cut off the tops; cut them into quarters and puree, skins, seeds and all. Puree the tomatoes in batches, until they are thoroughly smooth. 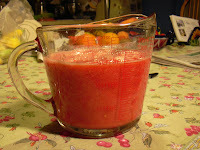 The tomato puree will look so pink it will resemble watermelon puree. 2-3 pounds of tomatoes will yield 4 to 5 cups of puree. Small dice all the vegetables and mince the garlic. 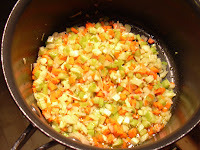 In a saute pan over medium -high heat, sweat in 2 tablespoons of olive oil - 1 medium shallot or 1/4 cup of onion; 1 large celery stalk; 1 medium carrot; 1/2 small fennel bulb; 2 medium cloves of garlic. After the vegetables are softened, add in 2 Tablespoons dry Italian herbs and red pepper flakes or Picantisime Seasoning. 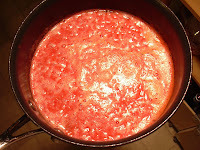 Add the pureed tomatoes to the sauteed vegetable medley and bring the mixture to a boil. Reduce heat and simmer for 30 minutes, skimming the foam off the top. 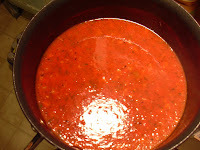 As the tomato puree simmers, it will thicken and deepen back to a familiar tomatoey color. After 30 minutes, add in 2 tablespoons capers. Season to taste with salt and freshly ground black pepper. If necessary, adjust and add more Italian herbs and hot pepper flakes. Continue to simmer. Add 1 & 1/2 pounds of fresh cod cut into large chunks and poach the fish for 10 - 15 minutes before serving. Cod is cooked through when it turns opaque. 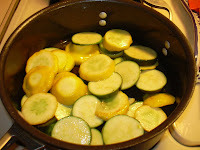 Serve with sauteed zucchini - such as patty pan squash or summer squash.